In what will hopefully become a regular feature, I’ve decided to review modern games that have a little Retro twist. Be them totally original games, or games that are remakes of classics. Incidentally, I can do reviews for X-Box Live Arcade and Wii Virtual Console/Wiiware. I’m just struggling for Playstation Network Games. So if you can, and want to help out, check out the “Write For Us” link. But now – Super Street Fighter II Turbo: HD Remix. Last Wednesday, as a thank you to my new found buddies at OCRemix, I decided to purchase the game they had help contribute to Super Street Fighter II: HD Remix, for the XBox Live. 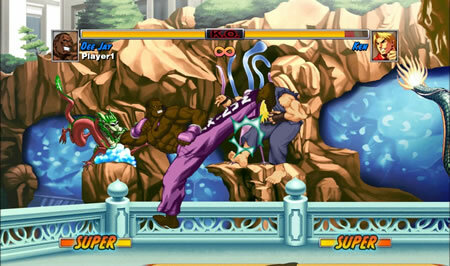 The game is a remake of what many people consider the best Street Fighter game: Super Street Fighter II Turbo. Released in 1994, it saw many improvements to the Street Fighter Franchise – Super Combos debuted, the characters became more rounded with more special moves that covered up the weaknesses before, there were three speed settings and – most importantly – it was a debut for Akuma in the franchise. Remixed in this game are three things. The first and most obvious are the graphics. They have been completely redrawn so that they don’t look arse on a HD telly. Also, play the game with the sound up and you will notice there’s a completely redone music score from the guys at OCRemix (which you can download at the bottom of the article). Fireballs now have a great look, like it is actually fire. 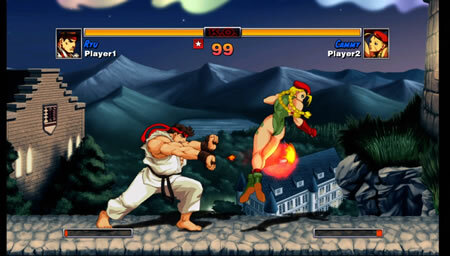 And Cammy also transfers well into HD. More subtle and noticeable only to long time fans are the game mechanic changes to weaken some characters and strengthen others. Move activations have changed – some charge moves are now rotations, and the main ones are that 360 rotations such as Zangief’s Spinning Piledriver are now activated by half turns. Overall, it makes it more balanced, but the “classic” mode is available, with the old commands if you wish. So what do you get game wise for your £10? Well, you get a single player mode, which is really two (classic & remixed). Remixed is a heck of a lot easier than the classic mode, which was noted as being the toughest game of the Street Fighter Series, but you also get a fairly extensive Multiplayer mode, which can be played both offline and online. The multiplayer mode online is what many people are looking forward to, so how does it play? Well, the problems that crippled the predecessor – the fact there was insane lag and everybody was insanely good – have disappeared. The game now moves at a fair pace, and even on ranking mode you can still win matches, particularly if you don’t play as Ryu or Ken (most people do play as them online, so if you learn a character other than Ryu or Ken, you have an unfair advantage, as people are unfamiliar how to fight anybody that’s not Ryu or Ken). The game modes online include a unranked, ranked (score goes towards a leaderboard) and two more social games, tournament & player. Some characters have been strengthened. Dee Jay - amongst some circles - is now one of the best characters. Tournament is your standard, 8 player, single elimination tournament. Which is fun, but if you lose one game you have to sit out, or leave. But the most fun can be had in Player Mode. This replicates arcade gaming, with “Winner Stays On” mode with upto 6 players, 2 fighting and 4 spectating. It’s incredibly easy to find a game, and unlike Ranking Mode, you get to know the people you play against, so much so that on my second Player Game, I increased my friend list by 4 during the game. It’s a lot of fun, and really sociable, and nobody (well, very few people) are arses. It completely adds to the game, and is the most fun to be had on the game. So, bad points? Well, no “bad” per se, just minor niggles. The fact there’s no scoring on arcade mode, a ranking system I haven’t worked out yet (I have won more games and lost less than my friend who has a higher ranking than me), and the fact there’s no bonus stages (though there weren’t any in the original game) were all pointed out to me by my online friend Oli. There’s a few minor bugs – the music inexplicably stops at times, and the energy bar inexplicably corrupts after a laggy game. The only other major fault is other players. Come across a griefer, who will insult you if you’re losing, or quit if you’re winning, and it won’t be fun. However, they’re few and far between. There is a great crowd surrounding this great game, and it is as perfect a version of street fighter 2 as you could get. The Remixed version eliminates the trickiness that existed on single player, and the online mode – particularly “Player Battle” – on voice chat with people that are not arses, you can’t get any better. For £10, on Xbox Live Arcade and Playstation Network, you can’t get any better. Thanks to Olithesup3r for some of his thoughts.